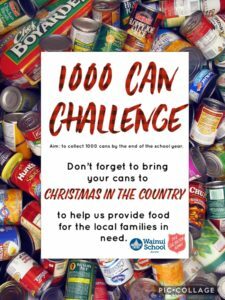 This year we, the 2018 Student Councillors, are taking on the 1000 Can Challenge. Christmas time can be tough for many people, especially when it comes to providing for their families, so we want to collect 1000 cans of non-perishable food to donate to the Salvation Army in Red Beach. The cans will be added to the Christmas food parcels the Salvation Army provide and distributed to local families in need. We are starting to collect cans now but will be also be collecting them at Christmas in the Country. During the week, cans can be brought to Kauri class and handed to the student councillors. On Thursday the 6th of December, as an entry fee on the night, we would like you to bring at least one can per person to add to our 1000 Can Challenge. There will be decorated recycling bins to stack the cans in on the night. For each can donated, your child will receive for their house, one token per can. 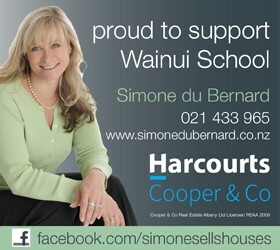 The house who has donated the most cans will win for themselves a treat. What a great way to end the year while giving to an excellent cause. For more information, you can contact either Mr. Irvine or the student councillors. Also, if you have too many cans for your child to carry, let us know how we can help you get them to us. We’re only too happy to help.